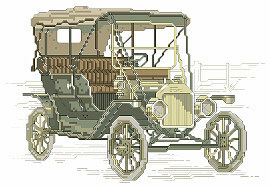 PDF Download - Savor the feeling of yesteryear as you stitch this wonderful image of a vintage car. You can almost feel the gentle vibrations as you ride along a cobblestone street. It is a beautiful companion piece to the Vintage Locomotive and Vintage Airplane.